I’m just going to say it. Building apps is hard. Building great apps is really hard. And building a financially successful app is, well, harder than the first two combined. My company Tapity has always bootstrapped. It hasn’t been easy. Despite winning an Apple Design Award, building apps that hundreds of thousands of people buy and love, and writing a surprisingly successful book on app design, we still struggle. Supporting a handful of families as a small business isn’t easy. Never will be. But this is what we love to do. How could we not? It’s in our blood. This is the life of an indie, and there is still so much opportunity out there. Running a business in any industry has never been easy and there are very few industries where that little indie developer can compete with the biggest brands in the world and win. Sometimes. I love it. This article is dedicated to my fellow independent developers. Though we are technically competitors, those who spend any amount of time in the iOS community know, we are really in this thing together. So some of you may have heard about our little time tracking app called Hours. It just launched a few days ago. Since this is more of a story, I won’t spoil the ending but only to say that I think we can learn a lot both from success and failure and in this case we are talking about success. With such a sentimental beginning, I will try to cut to the chase and highlight the big lessons learned. 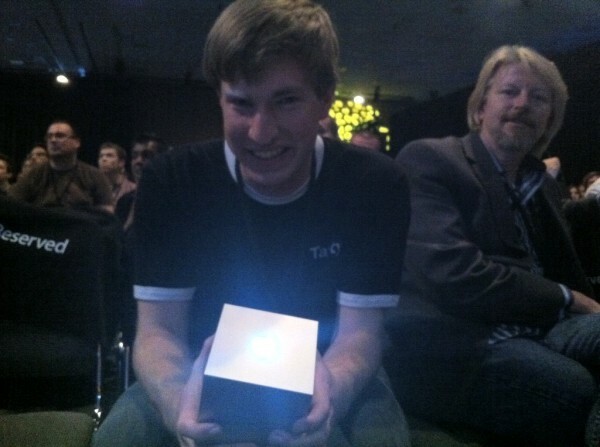 Three years ago my app Grades won an Apple Design Award. That was crazy and it is what really pushed me, my dad Todd, and my brother Josh to go full time on my company Tapity. We quickly realized that, while Grades was great for our reputation, it wasn’t making near enough money to support all three of us, so we started doing some client work to support the company. Time tracking was a big part of our life and it quickly became one of the more painful ones. We forgot to start our timers, we forgot to stop them, we made mistakes without knowing it, and some days our time tracking was absolutely useless. We lost money because of it. While lots of solutions gave basic time tracking functionality, it seemed like no one had really taken the time to get it right. Apps were solving the technical problem but few were paying attention to the human problems. We did some market research and found out that we weren’t the only folks who were willing to pay for good time tracking software. It scratched our own itch and made business sense so we figured we would give it a go. Over the years we put Hours on the back burner a number of times. We partnered with the iTranslate guys to build Languages, an experience I detailed on Smashing Magazine (part 1, part 2), we put out another version of Grades, and we tended to always be swamped with client work. Hours had to fit in the cracks. But eventually we were able to focus on it and we brought in a fantastic partner, Five Pack Creative, to do the majority of the programming so that we could focus on the design. I’ll be writing an article on our design iterations so stay tuned but for now, here is the basic design we came up with. We found out that having a timeline at the top allowed you to easily identify and fix mistakes in your time tracking so we based the whole design around that. While I can’t cover the design in this article, I do want to note that at the end of the day, it doesn’t matter how much marketing you do if you don’t get the product itself right. The reason I am not focusing on the design in this article is that when I asked on Twitter what people want to know about, the overwhelming response was: how on earth did you market the app? 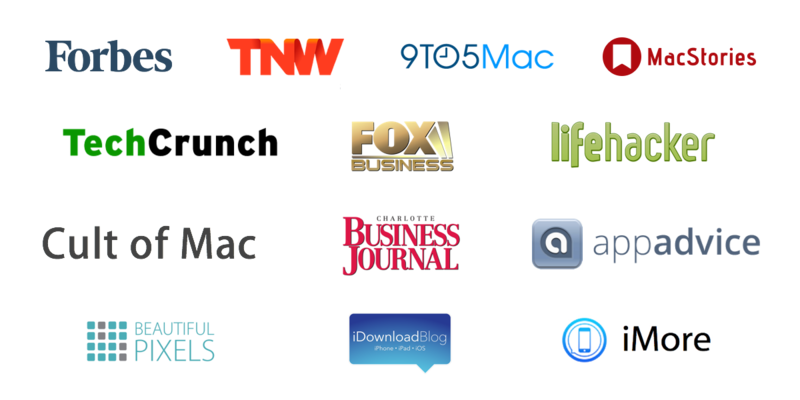 Some seem to believe I have this magical ability to get featured by Apple, TechCrunch, etc. etc. etc. I don’t. It takes time and a lot of hard work and I started out just like anybody else so this stuff is completely do-able. I don’t have all the answers but I’ll tell you what I did. I’ve heard some developers downplay the launch of an app and talk about how ongoing sales are what you really need to care about. I agree that ongoing sales are more important for sustainability, but the launch is your big opportunity to make a huge splash and get the critical mass you may need to prime the pump of organic, word-of-mouth, sustainable growth. Don’t bet the farm on the launch, but why wouldn’t you do everything in your power to have a great launch? Of course, back then I had no idea it would be another year before Hours came out — ideally I like to start really marketing apps a couple months before launch. Any way, that initial post was nothing special but pay attention to the call to action at the end: the mailing list. One thing that I learned from writing a book with Nathan Barry and making $36k in one day is the power of email marketing. 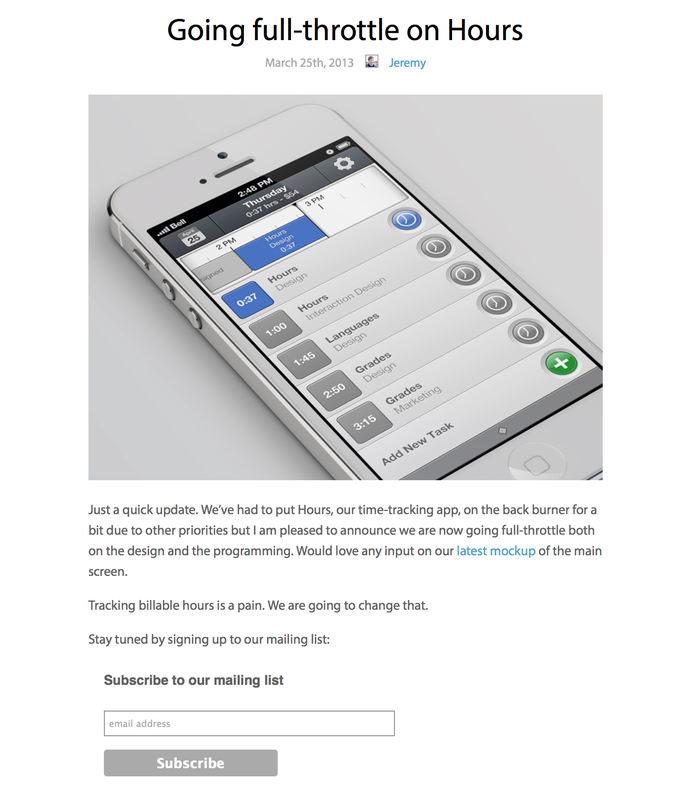 A good mailing list trumps getting featured on all the big tech blogs. It also gives you a way to capture excitement for the app and store it away for later. So leading up to the launch, the list was priority number one. Everything we did — the teaser website, the twitter account, and the blog posts had one purpose: to build that list. It started slow but by the time we launched we had over four thousand subscribers. That was huge for the launch. So how did we get those subscribers? Mainly by writing blog posts that went viral. 355 people on the site at one time took out my server for three hours. Responding to iOS 7 — hit the Hacker News homepage and was eventually picked up by a bunch of other sites, generating over 30,000 visits. Lesson learned: get a better server. Tapity.com was down for three hours of peak traffic. 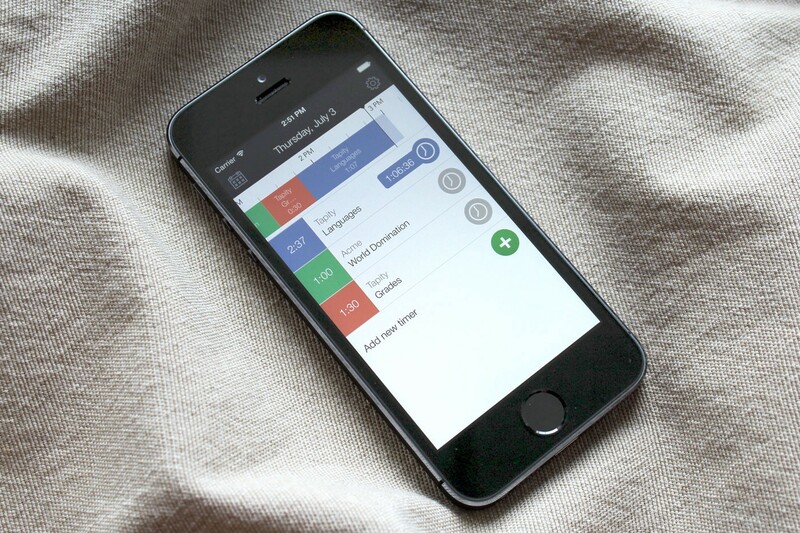 Quartz Composer key to iOS 7 design — got picked up by Forbes and others. Yep, paid apps are dead — I regret the title (the article is much more nuanced) but this post went crazy. Marco Arment, TechCrunch, etc. etc. Tutorial: getting started with Pop — this gave me the opportunity to show off the cool animations that I was building into Hours while teaching others how to do the same. It went viral. All these posts dealt with timely issues and related them back to Hours, generating thousands of subscribers. I promoted these posts on Twitter, on Hacker News, Designer News, and even to select journalists and influential friends who I knew might have an interest in the topics. How did that happen? It starts by designing consistently great products and gaining respect, and even friendship, with great journalists. That takes a lot of hard work, getting out of your comfort zone, and thinking about their needs before your own. I could go on for hours about this but this Smashing Magazine article gives a good summary. I’ve never met Anthony Kosner in person, though I would like to soon. He is a top contributor to Forbes Tech. Since I frequently ran into his tech articles, I decided to reach out to him a few years ago about one of the apps that I was launching. Complete cold call but the story was right up his alley. He was interested but didn’t end up writing something. That happens — get over it! He did start reading the Tapity blog though (hint: in case you hadn’t noticed, the blog has been pretty key to my success). Journalists want good stories and if you become a fountain of noteworthy, thought provoking material, they will be all over you. 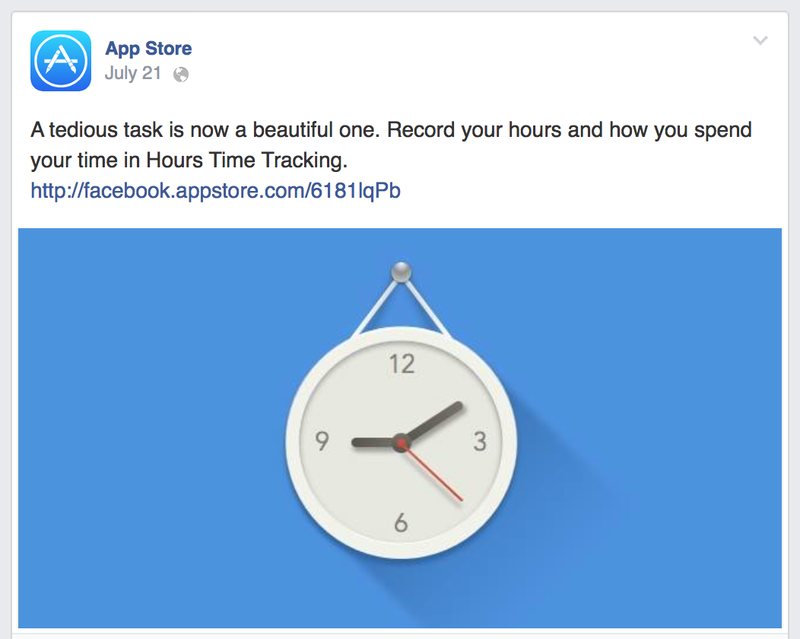 A few months ago, Anthony used an Hours animation we blogged about as an example in a post about app animation. Since then we have been in touch. 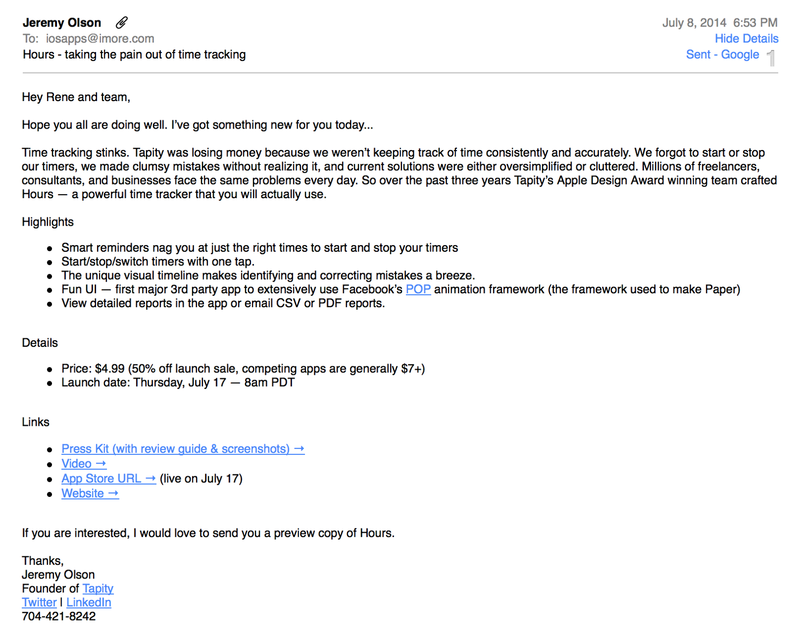 When Apple’s IBM deal was announced, I emailed him one line: this is a game changer for Hours. He used that quote and mentioned Hours in his story about that partnership. With that context, it isn’t such a mystery that we got a glowing review from Forbes. I could tell a dozen more stories for the dozen plus places Hours got featured. The point is, cold calling can sometimes lead somewhere but PR is mostly about building great relationships over time. Journalists love to have sources that they can consistently write about. Okay, how about the nitty gritty? What did my pitch look like. Usually something like this. Sometimes I would send a one line Direct Message over Twitter to gauge interest before sending this full pitch. This would help ensure the journalist notices the email in the midst of the hundreds of emails they get every day. I was also inspired by Dan Counsell’s excellent article on how to build a press kit. He talked about including a short Review Guide that talks about the app features and story angles — all the stuff you can’t fit into a two paragraph email pitch but that might be helpful in writing a review. Feel free to check out our press kit to see how we did it. I’m super proud of her. I think she did a great job. But I’ve learned even a low-production-value video is way better than no video when it comes to pitching the press. Apple helps those who help themselves. You build a great app, you build a lot of buzz and get a lot of PR — Apple notices. After an app launch or two that Apple likes, you might even start to build a direct relationship with folks at Apple. We are fortunate enough to be in that boat. I consider Tapity’s strong relationship with Apple one of our biggest assets. We had been talking to them for a while about Hours and they were kind enough to feature us on the App Store homepage as well as in a few categories. They also posted to their 10 million Facebook fans about the app. Crazy stuff! It is so cool to see all your hard work start to pay off. 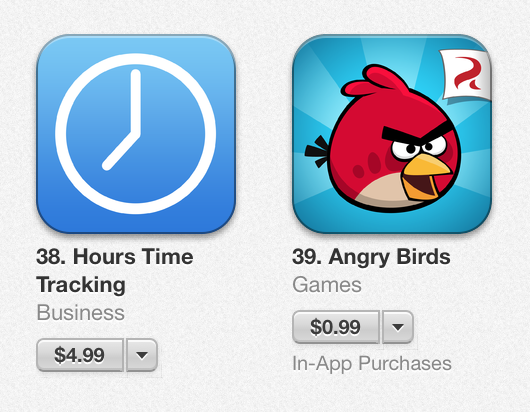 I’ve heard many developers complain that getting featured by Apple is just the luck of the draw. I couldn’t disagree more. Apple is actively seeking the best apps to feature and the fact is, even with over a million apps, most are not up to Apple’s high standard so your app can still stand out. And again, it is all about developing a relationship over time. 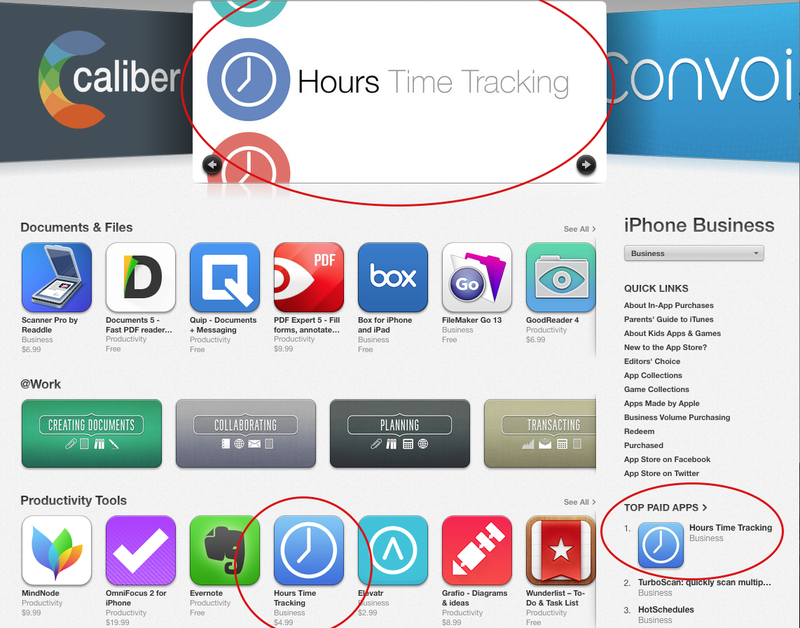 It is not an accident that Apple has featured all of our apps. They watch companies that consistently do good work. We had hoped that Hours could chart in the Business category but since we were pricing it at $4.99, we didn’t think it would go beyond that. We were floored by how wrong we were. 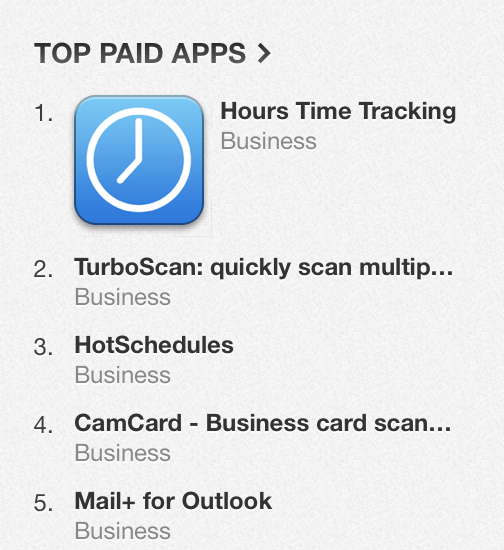 The app quickly became the #1 top grossing business app… but then it kept going. It eventually even passed up Angry Birds (always a personal goal of mine) at five times the price and peaked at #27 overall and #162 top grossing overall. There is nothing quite like the feeling that your creation, which before was just known by a few, is now helping real people in their daily lives just a day later. Just incredible. 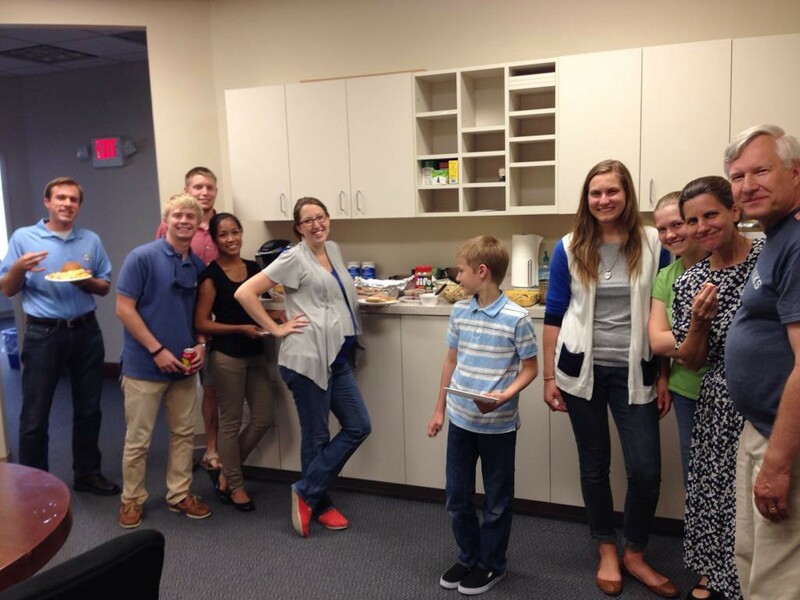 We celebrated at the Tapity office with North Carolina BBQ and home-made peach cobbler. It was fun. It was exhilerating. It was worth it. There are plenty of reports about how hard it is to succeed on the App Store. The statistics look pretty dismal. Don’t define yourself by the statistics. Anything that is worthwile is going to be hard. Let’s learn together how to build sustainable businesses on the App Store. On that note, I wanted to let you know about a online guide that I developed with that very purpose (you didn’t think you were getting away without me marketing something to you, right?) The course covers all the non-technical aspects of creating successful apps, from ideation, to design, to marketing. If you are interested in the guide or hearing about future articles, join our mailing list.